One of the places where your baby will spend most time during the first years of his life is the crib. It’s easy to see why a mattress makes all the difference in the world, as much as your baby’s comfort and health is concerned. You would want to make sure that your baby gets all the best, but that doesn’t mean you have to overspend. It takes some time and research to be sure that you’re making the right decision. And more often than not time’s pretty scarce when you have an infant child. That’s why, in this guide we’re going to look at all the different aspects when it comes to choosing the best crib mattress, and show you our top picks, so you can make an easier, better decision, and not waste time that you can spend with your child. 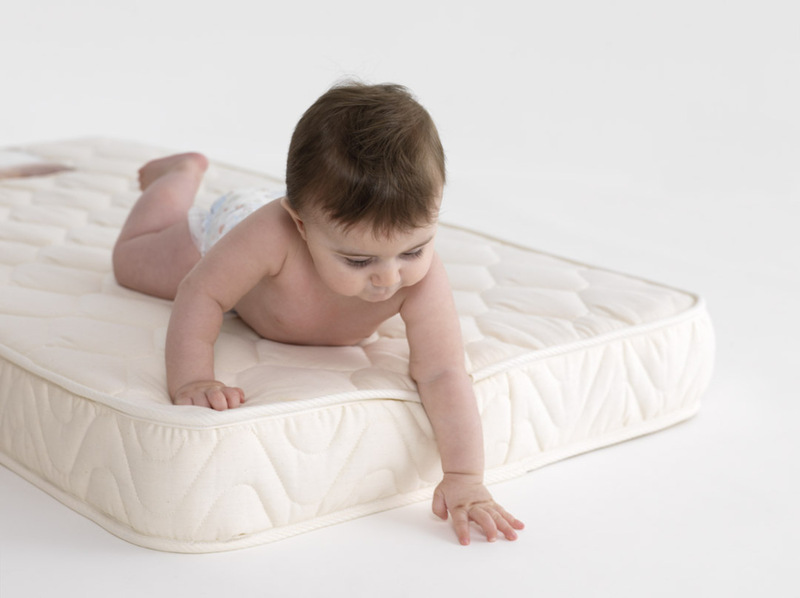 Basically there are 2 main types of crib mattresses: foam and innerspring, some of which are organic. Let’s see what’s characteristic for every type and what makes them different. These are generally the more cost efficient option. They’re also the lightest option. You can find this type in various thicknesses ranging from 3 inches to 6 inches. Thickness is, though, not the only aspect to consider about foam mattresses, there’s also density, which is a more important deciding factor. Better foam mattresses, have a higher density at about 1.5 pounds per cubic foot. Because, unfortunately, most of the times the packaging doesn’t show density, you can use weight as a good indicator. Higher density is recommended because, especially newborn babies need firmer support. This type of mattresses are considered to be generally more durable than foam. Although usually they are in a slightly higher price range, some models are well worth their price. One of the aspects that are considered to indicate firmness is the number of coils that a given model has. But there are also other aspects that contribute to firmness: gauge of the wire and the number of turns per coil. As a guideline: lower gauge means the wire is thicker. The best thing is to look at mattresses that has a gauge of under 15 with more than 135 coils. Some of the most popular types of mattresses that more and more parents tend to choose are organic mattresses. They come in both foam and innerspring versions. The big difference between organic and non-organic mattresses is in the materials used. Usual mattresses are made of different kinds of synthetic materials, which might emit toxic gases and could also trigger allergic reactions in your baby. Parents who have chosen this type of mattress for their kids’ crib generally say that although they paid in average more on an organic model of mattress, they feel it was worth the extra dollars to completely eliminate some probable risks that their children might face. There are various models out there that will probably be good enough, but your baby needs the best he can get. To make your choice easier we’ve done some research, analyzing the best rated crib mattresses and put together our favorites, so that you can use those extra hours, that you would have spent learning about all the different options you have, in a way that is more valuable to you. 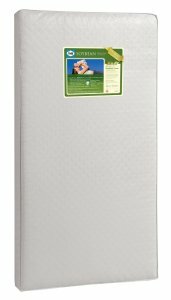 This is one of the best rated and most popular crib mattresses among parents. It’s a foam mattress that has a high density, thus offering a good support for newborn babies. Dimensions: 51.6 x 27.2 x 5 inches. It’s made to fit perfectly in most USA standard size cribs for babies and toddlers. 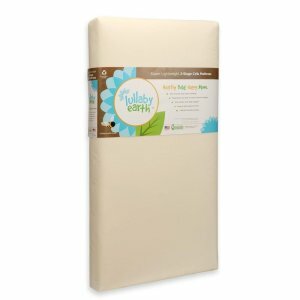 The Sealy Soybean Foam-Core Crib Mattress is the best affordable option that you have. There are lower priced mattresses but this one offers very high value considering the price range that it’s in. The Lullaby Earth Super Lightweight Crib Mattress is highly appreciated by most parents who have bought this for their kids. It offers an increased level of comfort and safety for your baby. It’s lightweight but at the same time, ensures the proper support. Dimensions: 52 x 28 x 6 inches. Cleaning it is very easily performed, and changing the sheets is a breeze. This is in a slightly higher price range but it offers a lot of comfort and support for the kids, and keeps them safe due to the lack of potentially harmful substances form them materials it’s made of. This is one of the best organic mattresses. 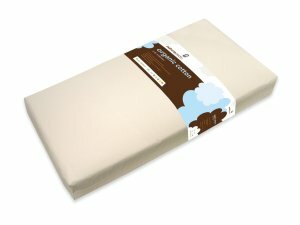 The Naturepedic No Compromise Organic Cotton Classic Crib Mattress is also one of the best rated organic mattresses as far as users of this product are concerned. It also features a different firmness on each side, perfect for babies and toddlers. As mentioned above, the firmer side is great for babies and the softer side is great for toddlers. This means you will not have to get a different mattress once your baby grows. It has a waterproof surface that is food contact safe and is very easy to clean. It will not allow fluids to enter the inner layers. 150 coils plus edge support makes sure to give your baby or toddler the perfect level of support. You get a lifetime limited warranty. Many parents who have chosen to go for an organic mattress say that they and their kids are really happy with the choice they made. It’s in a higher price range, but considering the fact that it only contains organic materials, it’s worth for your baby’s complete safety. 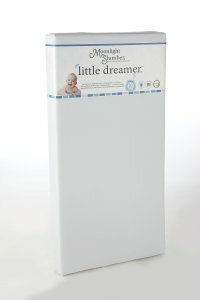 The Moonlight Slumber Little Dreamer is another great option for either babies or toddlers. It also has 2 side usability with different densities on each side. It’s a more economical line of mattresses but offers the same safety and support as the higher priced line from Moonlight. 2 sides, perfectly fitting both babies and toddlers. The infant side has super high density foam and the toddler side has high density foam. Both sides are firm, but the baby side has that extra firmness that newborns need. It’s free of the following substances: vinyl, polyethylene, PVC, pthalates and lead. It has a durable nylon cover that is non-toxic, waterproof and is easy to maintain. You get a lifetime warranty against manufacturer defects. The foam used in this mattress has CertiPUR Certification. It might not be the best of all crib mattresses but it made our favorite’s list anyway because many customers who have bought this model took the time to express their appreciation of this mattress. Currently, My First Mattress Memory Foam is the #1 best-selling crib mattress. It also has one of the highest average user ratings of all. We can’t really decide on a certain hierarchy of our favorite models, but considering the value you get for the price with this mattress, it might possibly be the best option for you, if you’re on a tighter budget. The high density foam of this mattress id firm enough to offer your baby the support he needs. It’s hypoallergenic, mite-proof and phthalate-free. It meets or exceeds federal flammability cpcs standards. The corners are square-cut to fit in both baby cribs and toddler beds. You get a 10 year manufacturer warranty. It’s way more than your kid will probably sleep on it. The cover is made of 100% polyester and is easy to remove and wash. 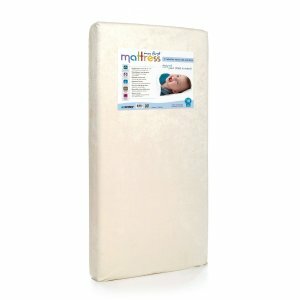 The Memory Foam mattress from My First Mattress is one of the best affordable crib mattresses that you can find. When we say that we don’t mean cheap, we mean high value for its price. Size. The law is pretty clear about the size of full size crib mattresses: at least 27.25 inches by 51.62 inches and a maximum thickness of 6 inches. But you have to choose a model that has the right size for your baby’s crib. The right size means that you cannot fit more than 2 fingers between the frame of the crib and the side of the mattress. The perfect size is very important because if the mattress is too small, there are certain hazards that your kid might be exposed to, like suffocation or entrapment. Firmness. Generally speaking, the firmer the mattress, the better, because especially newborn babies need that extra support. When your kid is in the first period of his life, he needs a firmer mattress than an older child needs. A firmer mattress will significantly reduce the risk of accidental suffocation. You can try this: put your hand on the center of the mattress and push it down. After lifting your hand, the mattress should get back to its initial position extremely fast without retaining the form of your hand. If it’s not, it might be too soft. Materials. If you want the mattress to be water resistant, you will have to look for double or triple-laminated mattress cover. The best thing is if the cover is also reinforced with nylon. Crib mattresses can take some beating and unless it’s sturdy enough, it will lose quality sooner than it should. Air Flow. Most crib mattresses have small vent holes. Look for models that have multiple vent holes, because due to increased chances of diapers leaking, mattresses without a good ventilation will tend to smell funny after some time of usage. So there you have it, everything you need to know about choosing the best crib mattresses, plus a list of our favorite top-rated models. We’ve covered every aspect, and before concluding this guide we would like to say a few words about safety. There are many used mattresses around that you can buy maybe for as low as half the price of a new one, but be very cautious about doing so, because a study published in the British Journal shows that there’s might be a direct relation between SIDS (sudden infant death syndrome) and used mattresses. By all means, avoid buying a used mattress for your kid. If you have a tight budget, some of the mattresses that we included in our list are really affordable. The price difference between a new one and a used one, that you would have saved is not worth exposing your kid to any risk.